react well to a crisis. Crisis Communication Training: A skills development program for effective organisational response during a crisis. When bad things happen to good companies, it’s already too late to ask, “Now what do we do?” We need a plan before a crisis strikes. 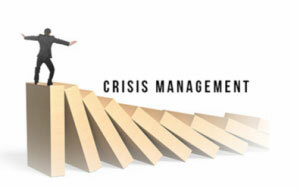 Better still, with Crisis Communication Training, a business can analyse where the potential crises are and cut them off before they become a problem. In a world obsessed with brands and image, it is dangerous to forget about corporate reputation. Each organisation is surrounded by stakeholders who have some area of interest in its activities; an individual browsing a supermarket shelf, a doctor considering prescribing a pharmaceutical product or a community examining plans for a new factory in the neighbourhood – stakeholders will be more influenced by the way a company conducts itself than by any glossy advertisement. This is particularly true in times of crisis. Reputation Australia conducts training workshops, providing your team with processes and principles for effective crisis communication. The session covers structures for a crisis team, managing the crisis team and the facilities it needs, information flow and handling the media. A mini crisis simulation can be built into the session, providing an opportunity for the team to put into practice the skills they have been exploring during the day. Managing your messages in the media. Templates to apply to their own organisation to assess it for risk exposure. A diagnostic tool to identify key stakeholders. A plan for identifying and recruiting suitable members of a crisis communication team for their own organisation. All these materials PLUS a copy of Mastering Media Interviews in the 21st Century. Reputation Australia also provides a very specific skills training course for those who will act as spokesperson in the media in the event of a crisis. All media training programs contain the following. However, programs can be designed specifically to meet your requirements. Generating Coverage – what constitutes a news story? Messaging – what would be the most effective thing to say? We research your business, your industry or business sector and your issues before each program to make the role-play exercises relevant. Each course is structured to meet the needs of each individual. This means that you get the maximum return on the time spent in the program. Our Trainers are committed to providing individualised coaching in a small group environment. Handling an issue or crisis can be management’s biggest challenge. It can represent significant risk to a company’s reputation, impact upon daily operations, traumatise staff, adversely affect customers, and damage short and long-term financial performance. Likewise, many issues test the capability of management on a day-to-day basis; staff morale problems, information leaks, legal challenges, deteriorating customer confidence, rumour and speculation in the media are among the more vexing challenges facing management today. There is no escaping the fact that in the 21st Century, the public will demand to know what is happening in a crisis and how management is coping. Companies can either try to deny this and suffer the consequences or responsibly manage the situation. The Reputation Australia team has been supporting companies and other organisations in a range of communication functions, including preparing for and responding to a crisis or serious issue that threatens their good name and brands. We’ve been doing this for more than 30 years. Our people are all seasoned veterans with a well-earned reputation in the field. We have people on the ground in Sydney, Melbourne, Canberra, Adelaide, Perth and Hobart. However increasingly, we are delivering programs in an online virtual environment opening up our training solutions and services to a broader audience spread across Australia and around the world. Contact us to find out more about our solutions. What can Reputation Australia help you with? The Reputation team was first assembled in 2003 and today, it includes experts in marketing, brand strategy, public relations, public affairs, the law, business planning and management consultancy, training, social media, graphic design and video production.